This is my tenth in a series of reviews for games that have fewer than three. It is my belief that Soccer 17 will not be "lesser-known" once it is actually released . . .
As I have discussed before in these reviews, story is king in a good game. A microgame - having less shiny chrome than a "maxigame" - can sometimes lose this in abstraction. But in designing Soccer 17, Jack Darwid has avoided such pitfalls with a number of aesthetic and mechanical decisions which create a large and loud soccer narrative despite the smallest of footprints. Image provided by the publisher. Wait! What is Soccer 17? 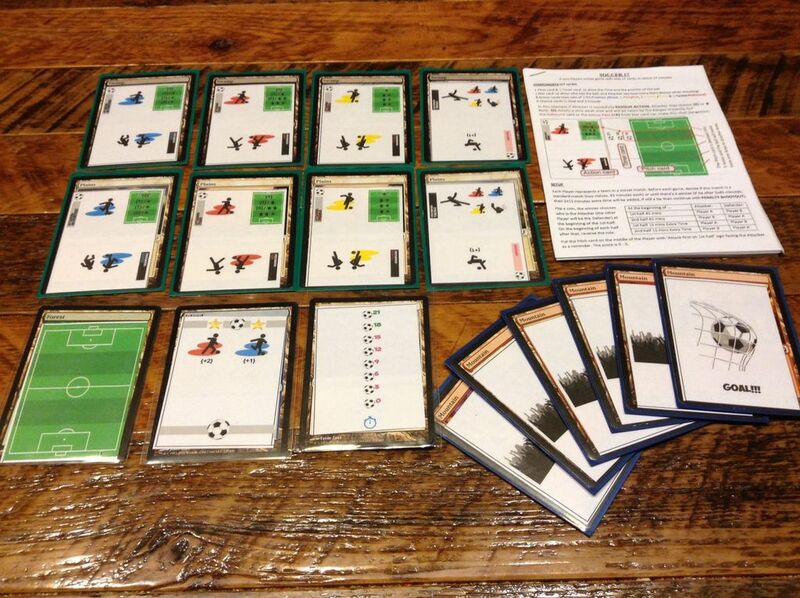 Soccer 17 is - appropriately enough - a 17-card soccer-themed microgame for two players which plays in about 17 minutes. Designed by Jack Darwid of Dungeon of D series fame his name is likely well known to PnPers, as well as to backers of last year's successful Kickstarter campaign for Roar-a-Saurus. PnP build of Beta files and photo by Ronaldo. How do I play Soccer 17? The 17 titular cards consist of 3 representing the gamestate, 6 used to determine whether a shot flies in or is saved, and 8 which are two identical sets of four cards used by the players to carve through defenses or steal the ball from the opposition. Once the first 3 cards are set - the clock showing zero and possession with the winner of the toss - each player simultaneously places one of their four cards face down. These are Revealed and Resolved based on whether the cards match (good for the defense) or not (usually good for the offense). Successful offensive plays either move possession closer to the opposing goal, increase the chance of scoring on a shot, or let that shot fly. Any time a player successfully gets off a shot, it will have a strength of one through four based on the gamestate. The striker draws a number of cards, one at a time, equal to the strength of the shot from the 6 cards of the goal deck. One of the 6 shows GOAL! The other five represent the crowd reacting to the ball as it flies towards the net, reacting to the keeper as he scrambles to get there in time. If the strength of the shot is used up and the ball has not yet found the net, the attacker may choose to discard the Rebound card, which is then lost for the rest of the half, in return for one more draw from the remains of the goal deck . . .
Take a breath, reclaim your Rebound / Tackle card, and kick off the second half . . . Image provided by the publisher. It all looks so simple . . . So, why should I play Soccer 17? Though the rules are immediately straightforward and accessible - there are after all at most 4 cards to choose from each turn - the angst that goes into each decision is astounding. If the colors match, the defender has stolen the ball and takes over possession. If not, the attacker either moves toward goal, increases a striking bonus, or shoots based on the card played and the position on the pitch. It sounds almost too simple on paper. Good thing the game is played on grass . . .
What makes it so delicious is the balance between the 4 cards. - Only Red or Blue allow a player to shoot. - Only Blue and Yellow allow a player to advance. - Red and Blue often allow a player to choose to advance, increase or shoot. - Yellow often allows both movement and an increase. You will notice I haven't mentioned Purple yet. Purple cannot be used on offense other than a last ditch attempt to force home a saved shot. It is, however, a powerful option on defense. A Purple Tackle steals the ball from both Red and Blue - both of the cards that produce a shot . . . However, playing Purple on a Yellow Dribble results in a foul - a Free Kick or Penalty - and the loss of the Purple card for the rest of the half! This has led to the amazing (and for fans of certain teams, all too familiar) spectacle of a team having the ball in the box Dribbling repeatedly, trying to draw out the Tackle rather than putting a foot through the ball to try and score, and having time run out on the half with the ball still at the forward's feet. Imagine the expressions on the faces of the two players. Now picture the faces of two sets of opposing fans at the final whistle. Soccer 17 has captured an essence of the sport that every fan will instantly appreciate. There are many other such bluff and double-bluff moments that occur every game which are a joy to discover, while remaining thematically vividly recognizable. I have had games where I was inside my opponent's head from the kickoff, seemingly able to advance and shoot at will. I have had games where my opponent stymied my every attempt to attack, but was unable to stick the ball in the net himself. I have had extra time glory, paid the price for dirty tackles, even watched a last second attempt at an equalizer blocked by the defender as I tried to pass the ball into an open net . . . I have had far too much fun with these 17 little cards. Image of Beta files provide by the publisher. If you refuse to play a sports-themed game, or dismiss the RPS mechanic out of hand, this game is not for you. But for almost any other gamer there is a whole lot of game in this tiny package. There is the building excitement of a shot on goal, the agonizing guessing and second guessing of which card to play each turn, the enormous risk-reward balance of the Purple card, the cheers, the jeers, the laughter, the fun. The tagline - "only 17 cards, in about 17 minutes" - while good copy, is not precisely accurate. A 17 minute game would mean every turn took 30 seconds, and while occasionally a player might take that long to make a particularly crucial decision, the game tends to fly along much quicker than this, closer to 10 minutes in total. As such not only is Soccer 17 great filler, it also lends itself to Tournament play, and rules are included for extra time and the dreaded penalty shootout. It is also ripe for expansion, with Team cards in the works adjusting the result of one color in a particular zone for each player, based on the reputation of various National teams. I tend to like microgames, and soccer has long been my sport of first choice, so I was always going to take a look at Soccer 17. While I was expecting a quick timewaster, what I actually discovered was a game punching well above its weight class, creating grins and groans, moments and memories and a prized spot in my collection. You explain the game very well (plus this is an enjoyable review to read). I'm glad you enjoy the game! That's Soccer 17 is about! If you refuse to play a sports-themed game, or dismiss the RPS mechanic out of hand, this game is not for you. If you mean people who loathes sports in general, then I might agree. But many board gamers refuse to play spotrs-themed games because those games require some sort of knowledge of the sport in question to enjoy the game. This is not the case with Soccer 17. Of course, having watched a soccer game or two will help the action come alive in your head, but the excitement you describe in the review will come even if you don't know squat about soccer. I enjoy watching the world cup, but not much else, and I would never consider playing a more involved soccer board game. But I had no problems testing out Soccer 17, and I enjoy it a lot. I sometimes pick red at midfield just because it's the "weakest" card and my opponent would not consider defending against it. Also, the tackle card is a small stroke of genius and adds so much to this game. In example, you're the attacker, it's the last round of the match, you're just in front of the goal, in the penalty area, and you have one star giving you a bonus to blue. There is no reason to play yellow because it's the last round, and you'd like to get a shot. Red and blue will both give you a strength 2. So you'd think just pick one and it's fifty fifty if you can pull the attack off, right? Wrong. The defender has the tackle card, and is guarranteed to stop both your red and blue attacks. But if the defender plays tackle and you play yellow, you'll get a penalty shot with strength 4, which would be awesome... Suddenly the yellow card isn't useless after all. Oh, the choices! Again, both players know this. And that is the brilliance of Soccer 17. Avri tried hard to get me to like this, but yeah, RPS and I don't get along.